How did the US economy change ? 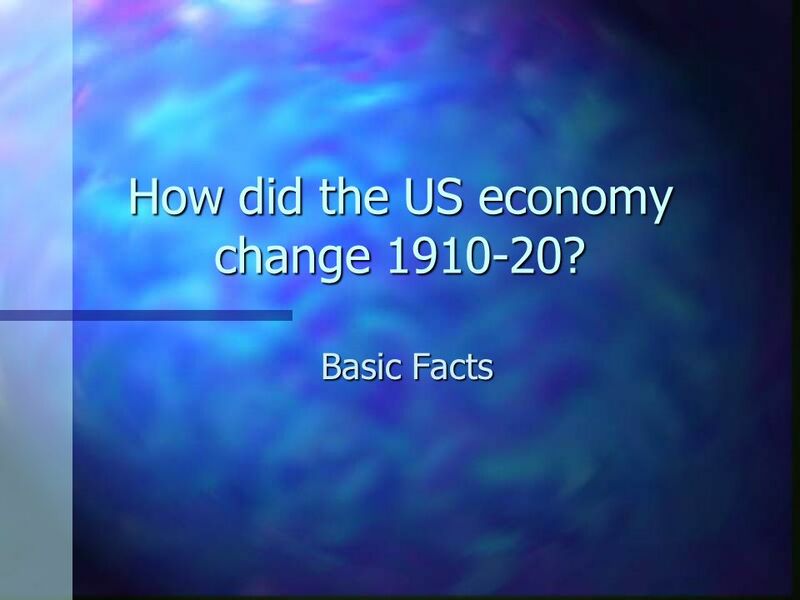 1 How did the US economy change 1910-20? USA had been reluctant to enter the war and did not join until 1917. 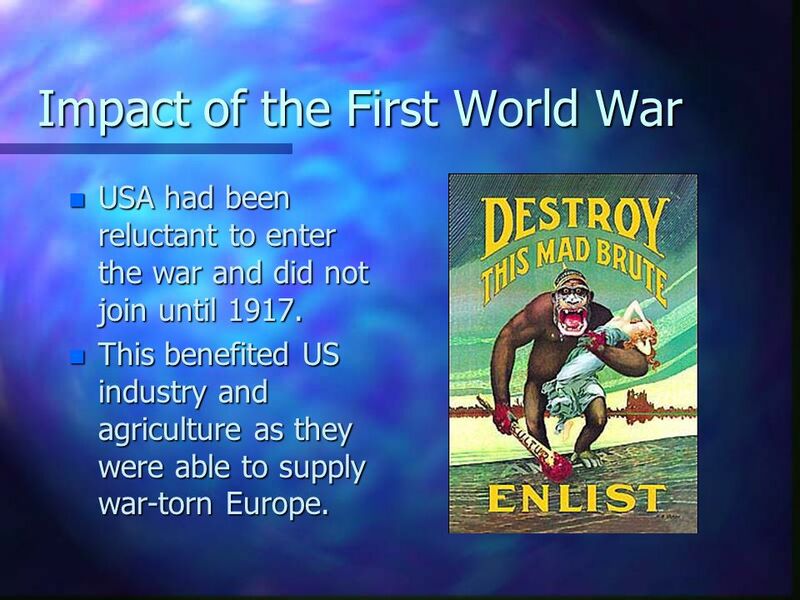 This benefited US industry and agriculture as they were able to supply war-torn Europe. 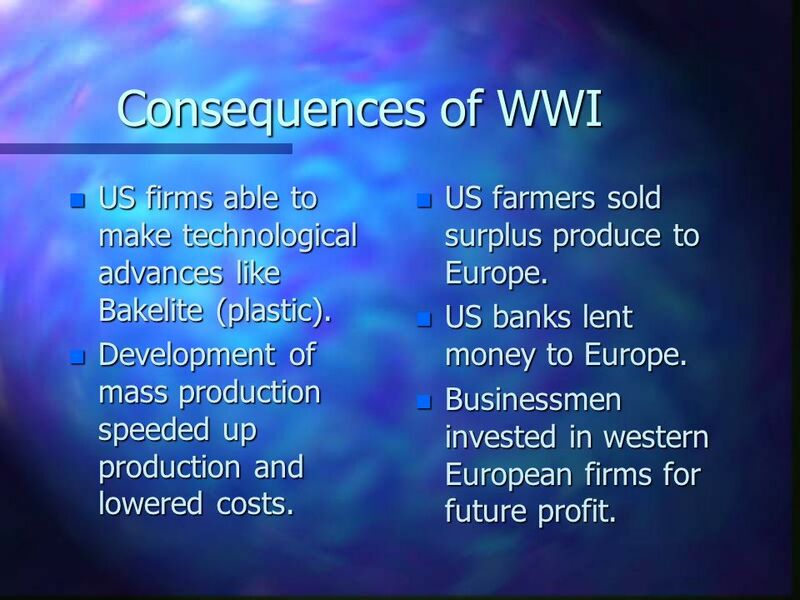 5 Consequences of WWI US firms able to make technological advances like Bakelite (plastic). Development of mass production speeded up production and lowered costs. US farmers sold surplus produce to Europe. US banks lent money to Europe. Businessmen invested in western European firms for future profit. 6 Consequences of WWI In the months after Nov 1918 many of the US soldiers returned home. 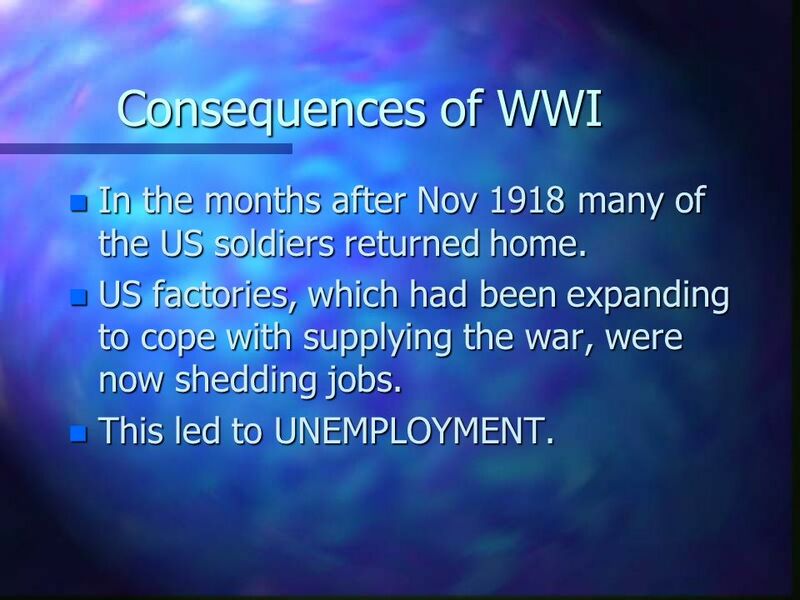 US factories, which had been expanding to cope with supplying the war, were now shedding jobs. This led to UNEMPLOYMENT. 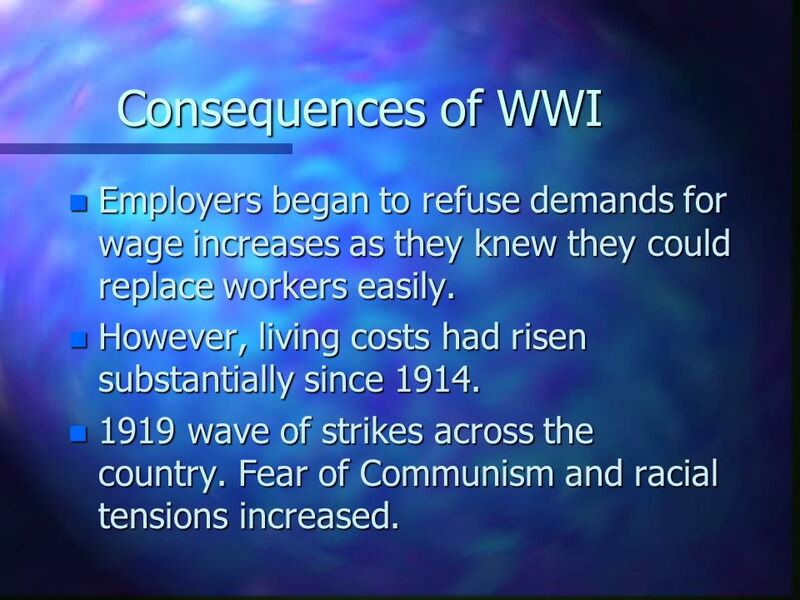 7 Consequences of WWI Employers began to refuse demands for wage increases as they knew they could replace workers easily. However, living costs had risen substantially since 1914. 1919 wave of strikes across the country. Fear of Communism and racial tensions increased. 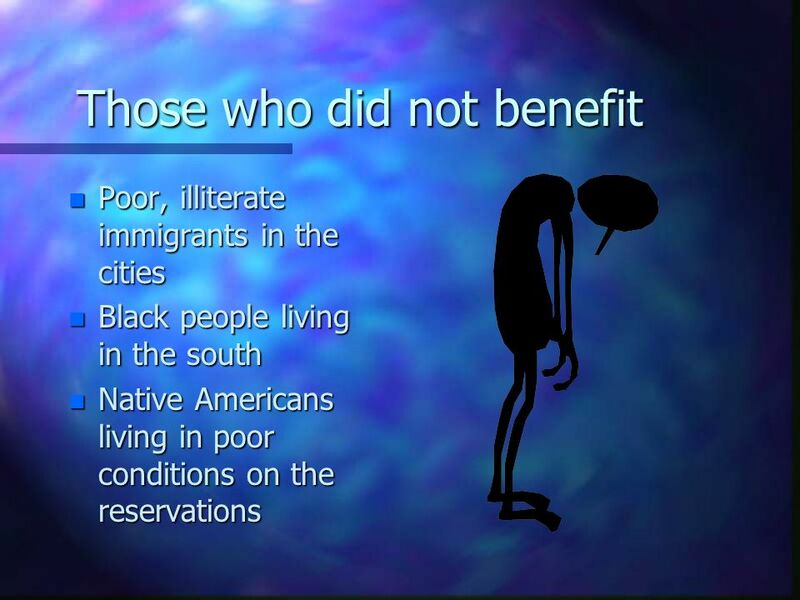 By 1921 over 5 million were unemployed. BUT slowdown did not last long. 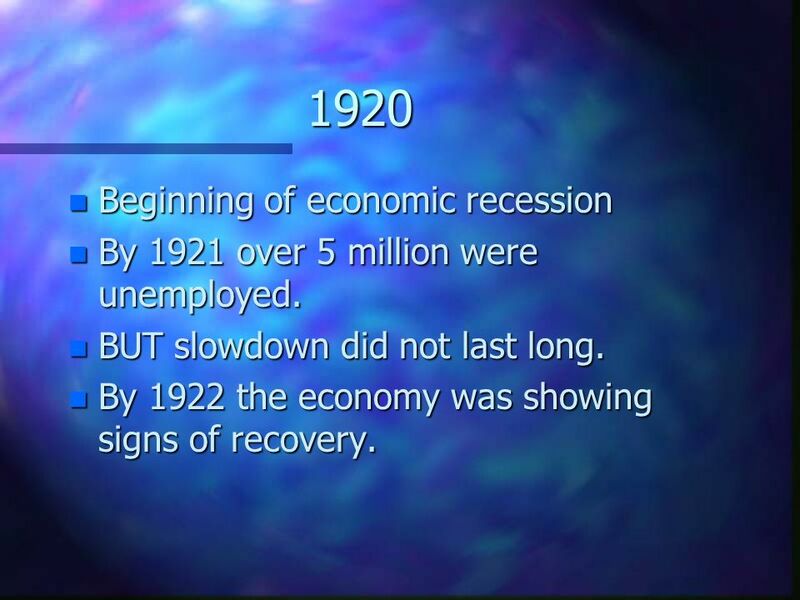 By 1922 the economy was showing signs of recovery. 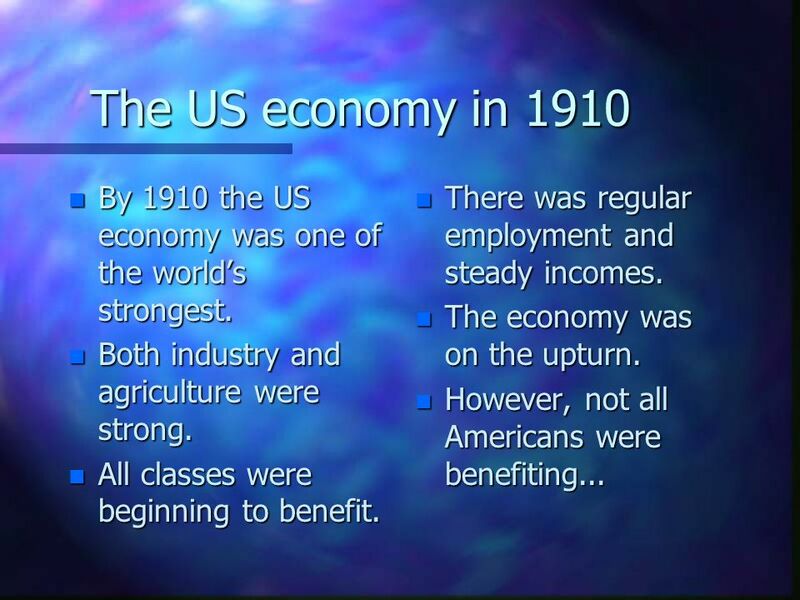 Download ppt "How did the US economy change ?" A Clash of Values Nativism Resurges Disillusionment and intolerance – Economic recession right after WWI – Increase in immigrants During WWIlow. In just ten years there was a huge increase in production. It has been called the SECOND INDUSTRIAL REVOLUTION. It was a boom in CONSUMER GOODS, that is. Labor After the Civil War. Population and Labor Force (in Millions), 1870–1920 Population is increasing, as is immigration. The labor force is also increasing. A worldwide depression.  In the late 1920s, American economic prosperity largely sustained the world economy.  If the U.S. economy weakened, the whole. Copyright © 2001 by The McGraw-Hill Companies, Inc. All rights reserved. Slide Workers, Wages, and Unemployment in the Modern Economy. Germany Germany Great Britain Great Britain Rise of Japan Rise of Japan Uneasy Peace Uneasy Peace Dawes Plan France THE GREAT DEPRESSION Recovery. 1920) World economy = a delicately balanced house of cards. Key card that held up the rest was American economic prosperity. HoJun. The Great Depression Social Studies 9. The Stock Market  A stock is a part of the ownership of a company  Companies sell stocks to earn money in order. The Business Cycle Ch.3 - Glencoe. Read to Learn Describe the four stages of the business cycle. Explain how individuals and government influence the economy.